Posted by Ada Wang on 11/28/2018 11:35:54 AM. Note: As we have several articles about this topic and some of them have thin content, so we published an all-in-one guide about using Epubor Ultimate to handle different situation like you are using Kindle Touch/Paperwhite/Voyage or just Kindle Android app. So please just click the link above to read that article. This article will not update anymore. Below is the original content. 1. Authorize your copy of Kindle for PC and "Sync and check for new items"
Install Kindle for PC and authorize your copy. Our software works with the new version of Kindle for PC perfectly. Run Epubor Ultimate, you'll see your downloaded kindle file display under kindle column. Just drag these files to the right blank window, voila, all your files will be decrypted immediately. I unloaded the latest version of kindleforpc and loaded ver 1.4.1. I just purchased epubor ultimate and I am disappointed by the fact that kindle azw3 files seem not supported. How can DRM be removed from the latter? If I have a kindle e-book on my PC before I try this will I lose it if I try this or do I need to download first. It doesn't work - have tried multiple times/options and always fails stating 'no key found'. Make sure all the books are synced by the same version of Kindle for PC (other than directly copied from your Kindle device or other sources) and you can read all the books on Kindle for PC! It's a lie, it doesn't decrypt anything, thanks god I didn't pay for it and I used the free trial, imagine I get to buy it?? ?, it would have been a waste of money that I would never have back!!! Sorry for the inconvenience. You may fail to decrypt the Kindle books if you do not follow the correct steps. Make sure all the books are synced by the same version of Kindle for PC (other than directly copied from your Kindle device or downloaded from Amazon Kindle's official site) and you can read all the books on Kindle for PC! Error: No key found in 2 keys tried. 3, Run Epubor software. 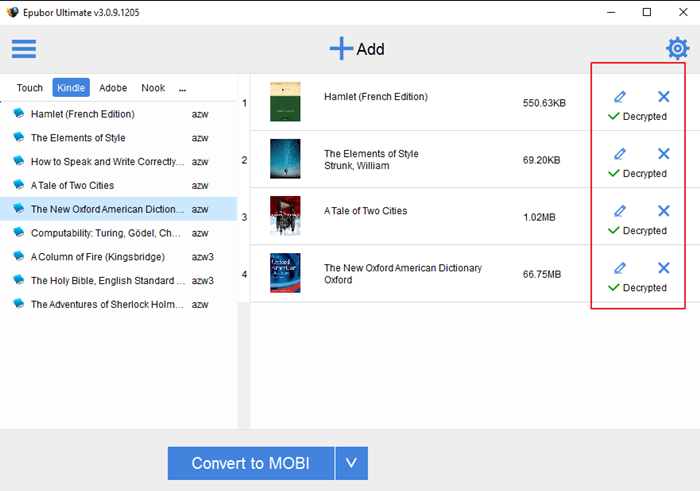 Drag & drop Kindle books from default Kindle content folder: "...\(My) Documents\My Kindle Content\..." and convert. Please feel free to tell us (support@epubor.com) for any further problem. I have downloaded the appropriate epub removal for Mac. However, I can't work out how to actually get the books from Kindle into the programme to convert them. Can you advise where you have instructions to enable me to do this? Kindle is greyed out and I can't access the files for the actual books in Kindle anywhere to convert them. Please click Help--&gt;Settings to set your Kindle eBook path, then the software will automatically detect and upload them. I am still unable to use this software. When I go into Kindle to follow your instructions from the link, there is no Tools &gt; Options &gt; Content. I can't go any further. Everyone's so disappointed and noone seems to have been able to make it work. However the dude who answers the questions keeps giving it 5 stars and falsifies the ratings. I have tried to purchase ultimate lifetime for windows with discount at 2checkout,but price as changed when I get to paypal please help.